The Christmas rush is coming…I've spent the last week doing all the clay projects, I have 2 more weeks of Christmas themed projects and then I'm prepping for Christmas craft day. Here is a angel that Grade 6 will start tomorrow. The substrate is wood. I had my carpenter 'father in law' cut hundreds of these for projects. The planks are 1.5" thick and 7.5" wide. They come in 8 ft lengths and are cut square. You could also use canvas, cardboard, or canvas board. They are thick enough to sit on a mantle or shelf. Daily Zen Doodles is a new book by Meera Lee Patel. It's a little workbook filled with prompts for doodling and inspirational quotes to help you relax and focus during your busy year. With the holiday season upon us we all need a little time to slow down and quiet our minds a bit. I try to do some drawing everyday, whether it's faces, my corner of the staff room, or what I see outside my window. It calms me and helps me think so I can plan out those 24 different Christmas projects or whatever else is on agenda. This book is a great way to get you started. I'll put the give-away details at the end of this post. Now back to the angels. - some everyday items for printmaking, pencils, lids, cups, etc. - printed text from the computer, "all is calm, all is bright"
Take your wood, sand any rough sides if needed. Paint the 4 sides and the front with white acrylic paint. Take your scrap of kraft paper and paint it white. Take a piece of wax paper, 6" or so wide, and crumple into a ball. Flatten out the wax paper. Using the leftover white paint print some shapes onto it with some everyday tools. I using circle shapes. I like to use ends of pencils and dowels, little shooter cups I get from the dollar store and corks. While our painting is drying we will make the body of our angel. Give each student a golf ball sized portion of model magic. I like using model magic in my mixed media projects. It's expensive so we only use it for one part and I tend to use my 40% off coupons at Michael's to buy it. Have the kids flatten out the model magic. Our backgrounds are 7.5" square so we don't want our body too big. Around 9cm or 3.5" max. I pre cut some strips of paper to use as a guide and you could also get the kids to measure with their rulers. Model magic is easy to cut. We just use a plastic knife. Cut a nice triangle shaped body. Now we want to texturize our model magic. I'm using a bottle lid and a glue lid. I'm also using my new favourite clay tools. These are cupcake decorating tools that I found at the Dollar store. I get 8 tools each with 2 ends for $1. Leave your model magic to dry overnight on a paper towel. When the wood slab dries we want to add our background colour. We are going for a distressed look, we want to see some white poking thru. Using a dry brush and being careful to only use little amounts of paint at a time brush on the background colour. When it's dry you can distress it further by sanding some of the paint off. Your kraft paper should be dry by now. Using the inside of my masking tape roll as a template I traced out a circle for my halo. I want a rich detailed design for my halo. Squeeze out a little gold and silver paint. To make my design I use cut pieces of cardboard, dipping the ends into the paint and making lines. Corrugated cardboard gives you a nice ripple. I'm also using my glue lid again, end of a pencil, and the end of a paint brush or wooden skewer. I use up my leftover metallic paint by painting my old book page. Metallics tend to be translucent but you can add a bit of water so it's more of a wash. You want to still see the text. This will be used for the arms so each student only needs a quarter of the page. When your model magic is dry paint with acrylic paint. I used purple. 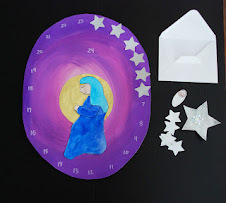 Squeeze out a little glitter glue onto your wax paper and then using your finger smear it on top of the paint. While my body and halo are drying I work on the face. I have a range of flesh toned card stock for the kids to choose from. They only need a little square. Using a plastic shooter cup (yes it's those same ones from the Dollar store) trace out a circle. Using coloured pencils I add the hair and rosy cheeks. With a sharpie I add eyelids and a smile. Your angel could have open eyes if you prefer. Cut out the halo and glue near the top of the background. Glue the face into the middle of the halo. To make the wings fold the printed wax paper in half. Cut a leaf shape on the fold so you have 2 wings. 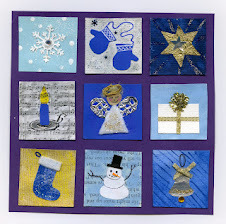 To attach to the background I use mod podge. 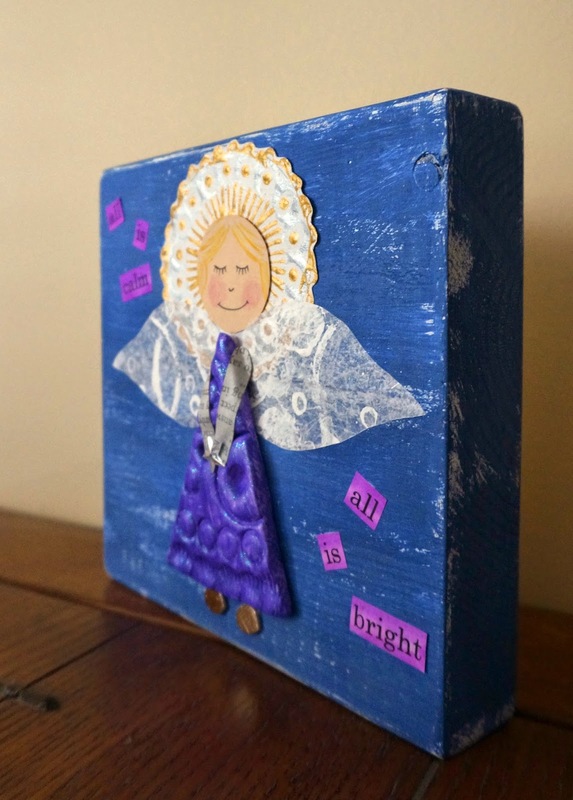 I use the mod podge instead of glue because I want it to dry clear. Glue can sometimes dry cloudy and you would see it thru the wings as they are a bit translucent. Glue on the body of the angel. I just use tacky glue. Cut the book page into strips for the arms. I added a sequin star. I printed out the text "all is calm, all is bright". I added some colour with some disk tempera. Finally you can add a coat of Mod podge to add a nice shiny finish and help keep everything in place. I'll make the draw on Friday Nov 28th/14. A big thank-you to Ulysses Press for sponsoring this giveaway! What a cool little angel! My daughters are younger, but I might adapt it for their age as a gift for their great-great-aunt. And that book looks fascinating - how generous of them to give one away! Wow, what a sweet little angel. I would love to win the book as well; thanks for the opportunity. Would love the inspiration of the Daily Zen Doodles book! Thanks for always being so inspiring! Love the angel. I'm going to try it with my daughter next weekend. I'd love to try drawing daily, thanks for hosting the giveaway. 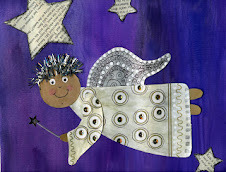 I loved your mixed media angel!! Very creative and fun to do. I think I might try it out with my class. Thanks for sharing. I'd love to win the Daily Zen Doodles book. With all the run around and stress that I'm going through right now, I think this book might just come in handy to calm me down. Thanks for a chance to win. The Daily Zen looks like a great inspiration kick-start. I'll be keeping my fingers crossed! Where DO you get the energy Gail? Beautiful idea for a Christmas pressie. I love homemade. I would be delighted to win the Zen Doodle book too! Love your ideas, and love your helpful tutorials. Would also love to win the giveaway. So creative! I love it! I tried to guess what every piece was made with before reading the tutorial and I was so wrong. The textures are awesome, the circle designs just right, and I love the wax paper wings. i too love your tutorials. it helps those of us that are not quite so creative think we could do this with our kids. i would really like your 'zen doodle book' to give to our daughter. she sustained a traumatic brain injury 21 yrs. ago and still exhibits symptoms, especially frustration in many things. i think this would be good therapy for her. I love your tutorials. Wish I could be in your class! I doodle all day so this book looks perfect for me. I enjoy your tutorials. I belong to a small group of ladies who quilt together each week. 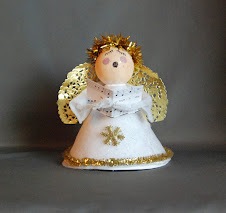 I am thinking of making Angels as a gift for Christmas. Thanks for inspiration :) Fantastic tutorial! very precise. And your Angel is beautiful. This is awesome Gail! I am so motivated to paint a canvas of my own. Cheers to the Christmas spirit in you! What a fun book to develop creativity one day/drawing at a time! Thanks for the opportunity! that looks like a good book! oh yeah. thanks for this chance to win. i found your site by my sister as a great creative site, and to do yourself of with others. Thank you for the Pastel Resist Madonna directions! I can't wait to use it this Advent!